These valuable mini-books make great handouts at conventions – they stay on the desk of your prospects and clients, like a huge business card that stays on your clients’ desks forever! Use as a conference promotional item. For orders of 25 or more, custom branding is available at no additional charge. Bulk sale prices are available for commercial needs of agents, brokers, insurance companies and associations. ● The BIG BOOK (Comprehensive Version) contains everything you need to know to reduce workers’ comp costs and improve safety step-by-step. 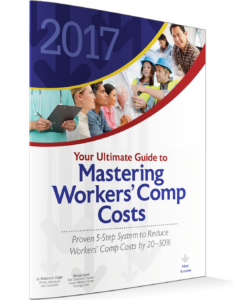 ● Our Mini Book summarizes each chapter of the big book and is a great overview of our WC cost-reduction process. ● The Pocket-Size Mini Book is a great client giveaway that helps your customers and keeps you top-of-mind.